Blog about enterprise applications development, SOA, Azure, BizTalk, SharePoint, C#, .NET, Security, Business Intelligence. There are different cases when you want to check your API, like performance or availability. For most cases there are bunch of monitoring tools which will ping your API or logger which will report and error. But what to do if you want to monitor a partner/integration API which is supposed to call your API and register something like sales. Ideally you dont experience any issues, like performance or errors, all is green, but no sales for long period. Partner can be down or VPN can have troubles. 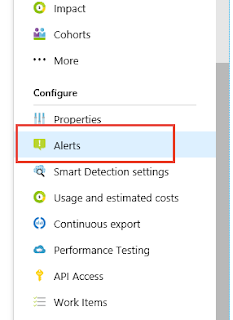 Lets setup an alert for API which should notify that something is wrong and there are no sales for long time using Application Insights in Azure. Create new alert and select resource which you want to monitor, which AI service. The complicated part is to select the condition. While working on small chess application had an idea to integrate Stockfish engine, so it will be possible to play with engine. The idea is to pass FEN and Depth for calculation to some API which will suggest the best move. My main problem is that the goal is to host engine in Azure, as function written in C# while Stockfish is in C++. There are of course some .net ports but really outdated and did not want to experiment with them. First step is just to clone git repo of Stockfish and build exe file, put it into separate folder in my solution. Stockfish is a command line tool. I will send the commands to console and read the output. Recently faced very strange problem. Application which was working great during last two years just suddenly had timeout on one particular page. The page was always very fast and was showing just last 12 records from the table. So I did what always was doing to check slow performing query, started SQL Profiler to trace the query. Query by itself is pretty complex and had a lot of parameters, Profiler is the best tool I think in that cases. After I easily found long running query in Profiler I copy pasted it into SSMS and what a surprize query just run in 300ms. Meanwhile the query from UI (asp.net) was running almost 2 minutes. The first to be different is session variables. To get info about sessions you can just select from the sys.dm_exec_sessions table. So you will need to provide ServicePrinciple id and key. It makes more sense to use ServicePrinciple in case you have a scheduled job to run and avoid surprise with expired token. 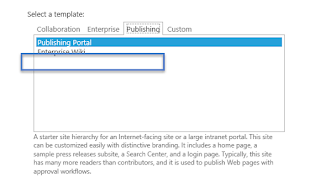 Product catalog template is not available in SharePoint 2016 preview. Was preparing for demo but I cannot see Product Catalog template in SharePoint 2016 Preview. Error occurred in deployment step 'Install app for SharePoint': Sideloading of apps is not enabled on this site. It means that the site does not have development feature enabled. Strange and stupid error message which could be more descriptive! the solution is actually more stupid. you cannot enable it from features because it is hidden, so just run this from PowerShell and enjoy. In case if you forgot to configure domain while installing SharePoint or do not know how to do that you can face an error while configuring DB for SharePoint. The easy way just pre create Databases before configuring SharePoint. Just run SharePoint management shell and run New-SPConfigurationDatabase command and answer some sample question. The command will create configuration databases so you will be able to skip that step in the wizard. May be not the best idea for production but in test environment this can save a lot of time.